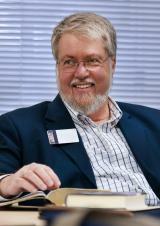 Von Clemans, current president of APCE, is a PC(USA) pastor/educator serving in adult educational ministries at Myers Park Presbyterian Church in Charlotte, NC, where he has been for over fifteen years. For over three decades he has helped congregations, educators, and pastors make appropriate use of technology in enhancing their ministry. He is married to Marion, a retired PC(USA) educator. They have two adult children and two grandchildren.